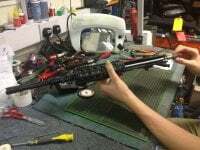 We offer a full and comprehensive repair and upgrade service for all your airsoft guns. 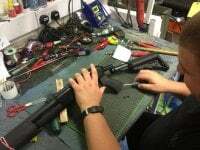 We have two full time professional technicians with over 35 years collective experience in airsoft repairs, who can ensure that your gun is brought back to life and firing as it should be. 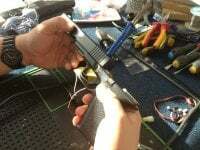 We can service your weaponry to keep it running in ultimate condition; boost the power, performance, range and accuracy of your rifle to enhance your gaming; give a blowback pistol some added kick; or pimp out your favourite model with customisation work such as mixing and matching different gun sections/components to build your dream gun. We competently cover all model ranges, from budget guns to top of the range PTW's. We hold a huge range of spare and repair parts in stock for many different types, models and makes. We also uniquely offer to order any spare part, from any manufacturer we deal with, even down to a missing screw - to ensure your gun is kept running at the peak of its performance. If it's just some advice you're after, or want to have a chat first about what is best for your gun, give us a call on 01202 769614. 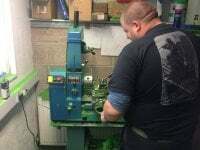 We won't try to sell you parts you don't need - our advice is honest, and comes from what we are confident to be the most experienced airsoft technicians in the UK! We can upgrade the power level (muzzle velocity) of any AEG or Sniper Rifle. A typical AEG upgrade on a Japanese rifle from 'factory standard' at around 280fps would increase to 330fps (1J) or 350fps depending on your choice, and we can take AEG's right up to 500fps if you so desire. Spring Sniper Rifles can be increased from a 'factory standard' velocity of again around 280fps to a typical sniper velocity of 500fps (or anywhere in between). We can even give some added 'oompf' to certain gas blowback pistols too! If your insides are good and it's a bit of cosmetic surgery you're after instead, thats no problem either. We can add any number of external parts to enhance your weapon; from railed foregrips and wood conversion kits to battery and stock enhancements. When things go wrong, to the untrained eye and ear it can be very daunting. Sitting in front of you is hundreds of pounds of quite complex gun, making all sorts of noises - or perhaps no noise at all! 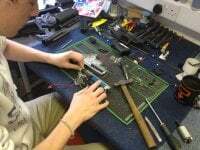 That's where our expertise through over 35 years of collective experience comes in, to identify then fix the problem, get your gun running like new and get it back to you, hassle free, ready for the skirmish! We can even get it collected from your home or workplace so there is the minimum of hassle for you! Just give us a call on 01202 769614 and we'll run through the problem with you and decide on the best course of action together. We launched a service option by popular demand, because those who look after their guns get the least problems on the battlefield. Servicing is something we suggest every year or two (or 6 months for gas blowback rifles). Much like a car service, we will clean the inside of the barrel and hop, clean any foreign matter out of and re-grease the internal components of the gearbox using the correct lubricants, visually inspect the internal parts for signs of failure, re-assemble, clean up and test fire the gun and perform an FPS check to ensure it is firing within it's expected range. If we do identify any components that have, or are likely to fail, we will contact you and give you the option to replace them at the time we are already inside your gun. This saves you the inconvenience of a future fail when you least want one, and the expense of having a separate repair labour bill. Our service option is only £49.95 which includes collection from your home or workplace, and re-delivery back to you afterwards. Our technicians have a well equipped and comprehensive workshop to aid them in the construction of custom parts for projects. 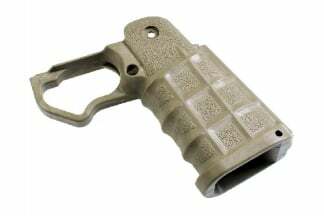 We can fabricate replacement parts for repairs from scratch, design and make in-house accessories such as blank grenade adaptors (and their internal components for repair! 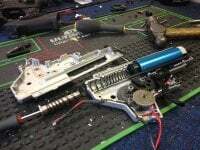 ), elaborate electronic work from detonator systems to MOSFET projects, create your dream gun by mixing and matching sections of different guns together (such as an MP5 SD front end to a G3 body with a M4 stock) or simply building you up a custom gun based on a specification you give us (such as a long barrelled M16 sniper, with RIS, bipod, scope, firing at 500fps and locked to single shot with a mosfet installed for instant trigger response). We can also design and build any configuration and voltage of battery you need, simply let us know what you are looking for or where you want to house it. The system time now is 10:08:55.